Nursing homes frequently cut corners to make a profit. In many nursing homes, staff members are overworked and underpaid. They lack the proper knowledge and training to deal effectively with residents’ needs. In such cases, an attorney experienced in nursing home abuse law may be necessary to hold the offenders accountable. Their irresponsible actions can lead to serious injury or death. Staff members often promote residentsâ€™ over-use of psychotropic drugs, like antidepressants, tranquilizers, antipsychotics, and anti-anxiety drugs. 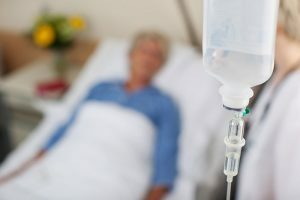 Used too much or in combination, the combined effect is overmedicationâ€”sedation that acts like a â€œchemical straightjacketâ€ for nursing home residents. Furthermore, if these drugs are used in ways not specifically tied to a residentsâ€™ care plan, the nursing home may be liable for damages. Improper use of drugs is never acceptable. At Solomon & Relihan, we take immediate action. Our experienced nursing home abuse lawyers have more than 40 years experience holding wrongdoers accountable for harm caused by restraints. There are two kinds of restraints commonly used in nursing homes: physical and chemical. While physical restraints prevent a person from moving by tying him or her to a wheelchair, bed, or fixed object, chemical restraints are drugs intended to control a personâ€™s behavior. The use of chemical restraints must be medically necessary and ordered by a physician. When used only for staff convenience, and not to treat an underlying medical condition, using drugs as a chemical restraint is against the law. The side effects of improper use of chemical restraints are serious. More than limiting a residentâ€™s ability to function, the long-term use of chemical restraints can lead to diabetes, thyroid dysfunction, and central nervous system disorders, as well as liver, kidney, pancreas, and other organ damage. If someone you care about has been injured by chemical or physical restraints in a nursing home, take prompt action. Speak with an Arizona lawyer who is an advocate for nursing home residents.